"Hey, isn't it reassuring to have a lot of people read you?" A24 has unveiled the first official trailer for The End of the Tour, directed by James Ponsoldt starring Jason Segel as the late author David Foster Wallace, who wrote the novel Infinite Jest. The film follows Jesse Eisenberg as journalist/fellow writer David Lipsky, who spends a few weeks traveling – it takes place in the mid 90s – with David Foster Wallace at the end of his promo tour for Infinite Jest. They talk about life, writing, discussing interesting topics over cigarettes and tape recorders, and it's a remarkable and wonderful film. It was one of the best films out of Sundance this year, and Jason Segel gives career-defining performance as DFW - read my review. See this! Ponsoldt's The End of the Tour is about the time journalist David Lipsky spent with prolific author David Foster Wallace while interviewing him for Rolling Stone. I loved film and raved about Segel in my Sundance review: "Honestly I felt like I wasn't watching Jason Segel, I was watching David Foster Wallace; Segel fully commits to the character and it's so mesmerizing to watch. He's that good, he's that endearing, and he deserves all the acclaim that is coming to him. To explore the mind of someone so brilliant yet who lives such a simple life is extremely compelling, and the comments he makes are profound." The End of the Tour is directed by James Ponsoldt (of Smashed, The Spectacular Now, Off the Black), from a screenplay by Donald Margulies, based on David Lipsky's book Although Of Course You End Up Becoming Yourself. 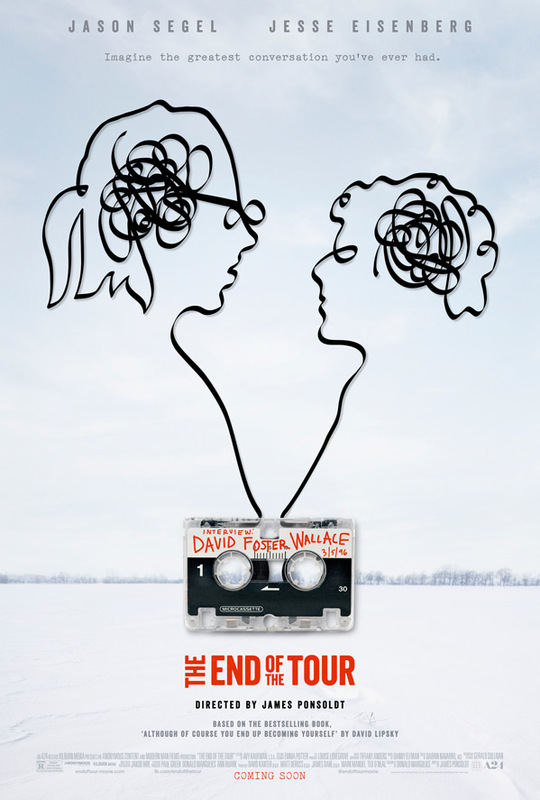 After premiering at Sundance in January, A24 is releasing The End of the Tour starting July 31st this summer. Both Smashed and The Spectacular Now were great, excited for this one. wow, I cannot explain why, but I found that to be one hell of an annoying trailer !! agreed. nothing in it made me want to watch it. Oy sorry. :/ Not sure, maybe it's just the context of them off-hand chatting cut into a trailer. Not at all annoying, mostly just fascinating listening to them talk. No need to apologize and I am not sure why I found it annoying. Just watched it again to give it a second chance and now even more annoying. Got an 'Almost Famous' vibe from this. Looks good and will definitely seek it out. No.. I think you should watch this and then you might understand why.. do it for personal growth. Bookmark this. Reply after you've seen it. Wasn't sure at first, but it looks really good. I have missed Segel's humour. Maybe I was the only one. So, there's no alcoholism in this?